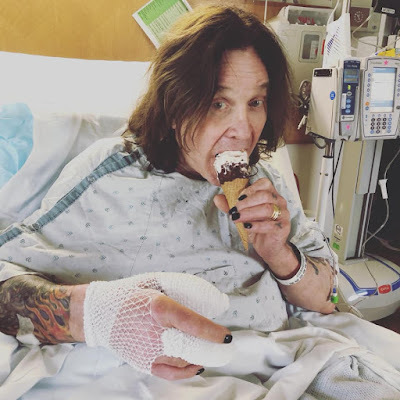 Ozzy Osbourne was forced to postpone an October 6 show at the Shoreline Amphitheatre in Mountain View, CA after undergoing surgery to treat an infection in his right hand. The rocker has issued a statement saying he will "spend a couple of days at Cedars-Sinai in Los Angeles where he’ll remain under doctor’s care as they monitor the infection." The October 6 show has been rescheduled for Tuesday, October 16; the support act for the new date is TBA. Ticketholders for the October 6 show should hold on to their tickets, as they will be honored at the rescheduled date on October 16; refunds are also available at point of purchase. Ozzy is expected to resume his North American tour on Tuesday, October 9 at the Mattress Firm Amphitheatre in Chula Vista before this leg of the trek wraps with shows at the Hollywood Bowl on October 11 and the MGM Grand Garden Arena in Las Vegas on October 13. Osbourne’s three-year “No More Tours 2” run – which celebrates five decades of music since the 1970 release of Black Sabbath’s self-titled debut album – will mark the end of global touring for the legendary rocker by the time it wraps up in 2020.